A team of researchers with the RIKEN Center for Emergent Matter Science and The University of Tokyo, both in Japan, has found a way to force a metal to be a superconductor by cooling it very quickly. In their paper published on the open access site, Science Advances, the group describes their process and how well it worked. Scientists around the world continue to seek a material that behaves as a superconductor at room temperature—such a material would be extremely valuable because it would have zero electrical resistance. Because of that, it would not increase in heat as electricity passed through it, nor lose energy. 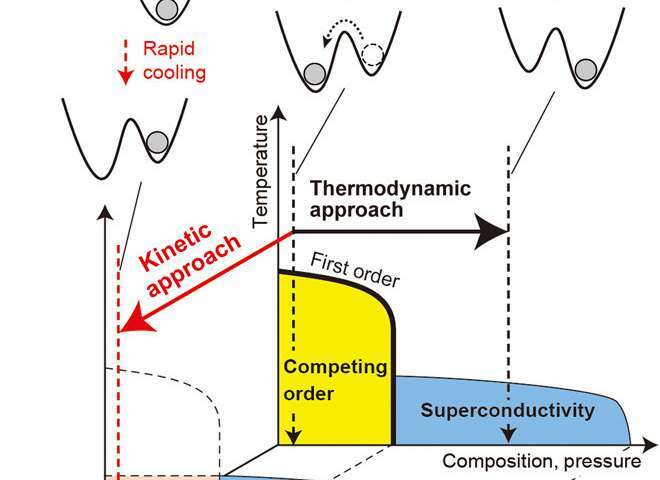 Scientists have known that cooling some materials to very cold temperatures causes them to be superconductive. They have also known that some metals fail to do so because they enter a "competing state." In this new effort, the researchers in Japan have found a way to get one such non-cooperative metal to enter a superconductive state anyway—and to stay that way for over a week. Noting that there is a very small delay between the moment when a metal reaches a temperature cold enough to enter a superconductive state and the onset of the competing state, the researchers came up with an idea—if the metal was cooled rapidly, it might not have a chance to enter a competing state. They liken the idea to metal forgers plunging their work into cold water after fashioning to prevent it from weakening. To find out if their idea worked, they made a metal sample out of iridium and tellurium. They connected electrodes and gave it a jolt of electricity. The jolt initially caused the metal to heat to over 27°C, but then it cooled very rapidly to -269°C, in under ten microseconds. The researchers found that via quick-freeze technique, the metal changed into a superconducting state for over a week. So hitting it with electricity cooled it? And it stayed superconducting for a week at what temperature? ...To achieve this quenching, we applied electric-pulse heating to a sample in contact with a substrate at 4 K.
I get the impression phys·org's writers are getting stretched too thin to think through the sheer volume of topics and give a full, perspicuous, synopsis. Commenters/readers shouldn't be doing their work for them. The site might want to cut back on stuff that doesn't even have a TENUOUS connection to physics. They also badly need to allow italic HTML in comments. Just italics. As it stands, even full unicode is proscribed. You can't make subscript or superscript numerals in a (semi) technical science websit? CO2? mc^2? C'mon. Ridiculous. I get the impression phys·org's writers are getting stretched too thin to think through the sheer volume of topics and give a full, perspicuous, synopsis. There is no such thing as a phys.org writer. These articles are taken verbatim from various science sites and science news outlets. Phys.org is an aggregation site.